3 days now and I have been ill in bed. It all began with a sore throat and even after a session of salt water gargling it did not stop there. It slowly progressed over the hours but I think I am on the road to recovery now. I don’t think I can call it flu and it is not just a common cold. I guess I am somewhere in between. I am not completely confined to my bed however, this has impaired or I am just avoiding strenuous activities like going to the gym, cooking (Indian cooking!) and others. I stumbled upon a column in the news paper which had an article on how the flu rate has increased in the past few weeks. So I have taken it as ‘it’s in the air’, Lol. What have I been doing? basically everything most of you would do. 1. Getting ample amount of rest. Thanks to the hubby who has been doing all the chores. Bless him. 2. Taking medicines. Lemsip and Benylin mucous cough have been my buddies. 3. Drinking sufficient fluids, i.e., warm water, warm water with honey, green tea with honey. 4. Eating at regular intervals. 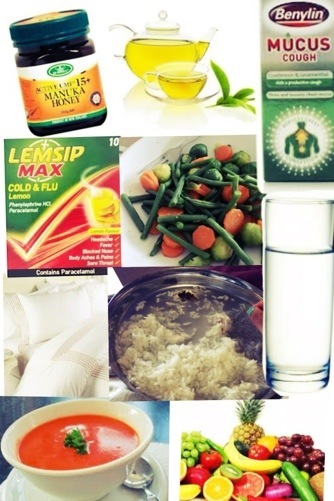 Soup, boiled vegetables, fruits, boiled rice, avoiding anything greasy, too spicy and cold.